The West Kootenay Transit System is recognized for connecting many rural communities for a very affordable rate, but there are areas that need improvement. 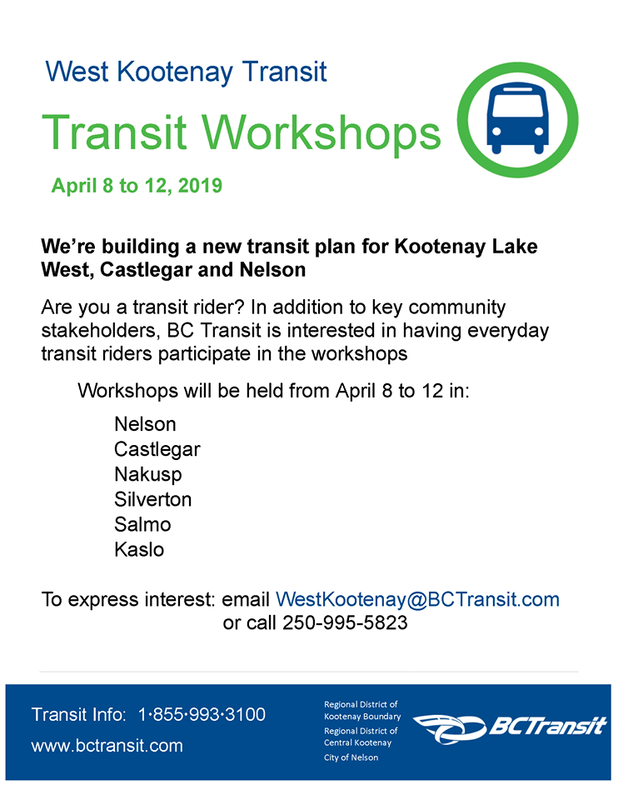 The Regional District of Central Kootenay and BC Transit are hoping to tackle some of those with a new transit plan which includes Nelson, Castlegar, Kaslo, Nakusp, Salmo, and Silverton. Research Analyst with the RDCK, Tom Dool, highlights one of the service gaps they’ve had an eye on. Frequency to parts of the Slocan Valley is another issue highlighted by Chair of the West Kootenay Transit Committee Leah Main. It only runs three days a week and she’s heard from many that five day a week is necessary for many who want to live in the valley but work in Castlegar and Nelson. As services are centralized this becomes a bigger problem, not only for health care, but for things like education as well. The route to Trail, where the Kootenay Boundary Regional Hospital is located, is especially busy with students attending the Castlegar Selkirk College campus, explains Dool. He also highlights economic development and sustainability as areas that benefit from good public transit and that it’s a priority for higher levels of government as well. Funding for the transit system is provided through fares, but local, provincial, and federal funding are all combined. 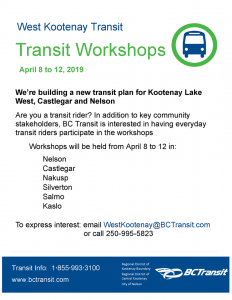 A new plan is developed every three to five years or so and stakeholders and transit riders are invited to workshops being held in the six communities from April 8-12. Groups include seniors, schools, the Interior Health Authority, local governments and more. Open houses are expected to be held in May where the public can weigh in as well.